The Norwalk Robo Warriors Gold (#14568) and Purple (#12783) teams competed in the Clark league of FTC competition. Overall team Purple placed first, while Gold placed third in their division. The First Tech Challenge (FTC) is a worldwide program for promoting STEM experiences for youth, ages 7th to 12th grade, but it is more than just robots. Norwalk’s robotics team has been tackling tasks from designing, engineering, and programming their robots, but they have also been working on items like budgeting and allocating resources for use throughout the year, marketing, outreach, and communication skills. First Tech Challenge is proven to encourage students to pursue education and careers in STEM-related fields, all while enhancing their work-life skills. This is the second year for Norwalk’s robotics program, and it has expanded into a second team, which essentially doubled the number of members able to participate. In their rookie year, the team placed 23rd out of 1425 teams in the Northern Region and want to use this experience to help them reach the World Competition, which is held in Detroit in April. On January 19th both Norwalk teams competed in the League Championship in Nevada, Iowa. Both teams finished the competition strong with Norwalk Gold finishing in second place and Norwalk Purple finishing in third. Unfortunately, only one team advanced to the next round of tournaments. 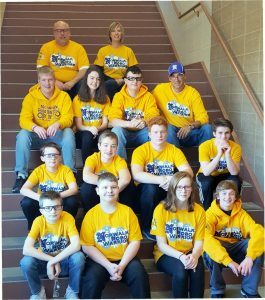 On February 2, Norwalk RoboWarriors Gold competed at John Deere Financial in Johnston in the FTC Super Qualifier. Norwalk had another successful tournament finishing in second place overall and in the process scored the fourth highest score in the state this season. 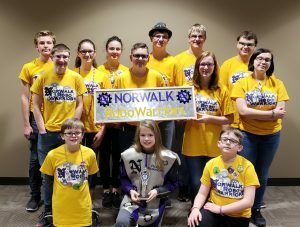 With their second-place finish Norwalk RoboWarriors Gold is now qualified for the FTC Iowa Championships on Feb. 22nd and Feb. 23 in Coralville. Currently both Norwalk teams are ranked in the top 10 of the State with Gold in 3rd and Purple in 6th. Norwalk RoboWarriors Gold is also ranked 92nd out of 7400 teams nationwide. For more information you can email us at robowarriors@norwalk.k12.ia.us, follow us on Facebook at Robo_Warriors or contact Jodie Irlmeier at the High School.